“We have cried together and laughed together. The goal of the Pastora Goldner Holocaust Symposium is nothing less than to help repair the world, but when the participants convened in June for the fifth event, the focus again began with each other’s worlds, each other’s souls. German theologian Britta Frede-Wenger described her life as a new mother, while American philosopher Leonard Grob shared his thoughts on continued scholarship and activism as he approaches retirement. Others, too, discussed the triumphs and sorrows that mark their lives as they delved into the darkness of the Holocaust in order to shed light on today’s world. Focusing intently on the discourse during the Pastora Goldner Holocaust Symposium are, from left, Samson Munn, president of The Foundation Trust, Boston, Mass., and Rabbi Steven Jacobs, the Aaron Aronov Chair of Judaic Studies, University of Alabama, Tuscaloosa. The challenge is daunting. 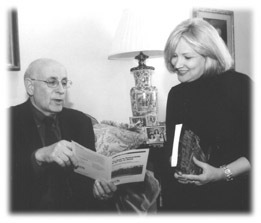 As written in the prologue to a recent book produced by several symposium members, “… the Holocaust continues to leave survivors, historians, philosophers, theologians, novelists and poets groping for words to describe and reflect upon, let alone explain, the immensity of that watershed event …” It is exactly that task, though, that drives these professionals. Their academic interests brought them together almost a decade ago, but their bonds of friendship now perhaps best define this unique network. The symposium, held every two years at Fairleigh Dickinson University’s Wroxton College in England, is unlike any other. It turns the normal academic conference inside out, focusing first and foremost on dialogue and community-building rather than formal presentations of academic papers. And, it features a diverse representation of 39 scholars from seven countries committed to working together on a continuing basis. The successes since the group first gathered in 1996 are certainly impressive. Collaborations and collective inspirations are producing important academic projects, artistic creations and public presentations, as well as a regular book series. But the greatest success is perhaps that which is hardest to measure: the formation of a true community. Above all, both wanted to make a difference in today’s world. They use the phrase tikkun olam, the repair of the world. “We wanted people to think about ways in which our studies could help us to think and to act, to help repair the world in the light of what we have learned about the Holocaust and other genocides,” Grob says. And both had discovered that the best and most fruitful moments of academic gatherings occurred during informal talks between and after sessions. “The goal was to make those casual moments the focus,” recalls Grob. Not an absentee supporter, Goldner attends the conferences, interacting and growing close to the participants. “It is wonderful to be among these scholars and friends,” she says. Her affiliation also has become somewhat of a family affair. Her three daughters, her sisters and other family members also have attended several events. · “How are we to respond in word and deed to a world radically transformed in which ‘business as usual’ no longer applies? · “How are we to utilize our learnings from the Shoah [the Holocaust] in order to face, responsibly, the genocidal potentials inherent in our own world? Immersed in dialogue are, from left, Andrew Charlesworth, lecturer in human geography, Cheltenham College of Higher Education, United Kingdom; Hans Rathenow, director, Institute for Social Sciences and Education in History and Politics, Technische Universität, Berlin, Germany; and Annegret Ehmann, independent scholar from Germany. Locke also was drawn to the notion of working within a “sustained community” and being able to renew bonds on a regular basis with fellow scholars. The symposium has worked “brilliantly,” he adds. 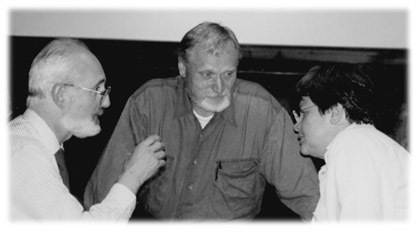 At the first Pastora Goldner Holocaust Symposium in 1996, the members were divided into six small working groups exploring different aspects of the Holocaust. Ideas quickly emerged from these gatherings, and one group eventually produced Ethics After the Holocaust: Perspectives, Critiques, and Responses. The book is edited by symposium member John Roth, the Edward J. Sexton Professor of Philosophy and director of the Center for the Study of the Holocaust, Genocide, and Human Rights at Claremont McKenna College, Claremont, Calif., and includes contributions from five other members. 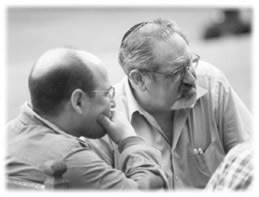 In 1998, the symposium sessions were organized around central themes derived from the participants’ suggestions, such as “The Endeavor to Face Radical Evil”; “The Shoah, Other Genocides, and the Call to Action”; and “Educating Toward Goodness/Away From Evil.” An in-house publication, Fragments From Wroxton, summarized the group’s work and was made available to the libraries of the members’ institutions. For June 2000, the scholars studied common texts to deepen their knowledge base. Also, “Remnants,” a one-man play based on interviews with Holocaust survivors, was performed by its author and symposium member Henry Greenspan, a lecturer in the College of Literature, Science and Arts at the University of Michigan at Ann Arbor. In addition, work began on an anthology titled After-Words: Post-Holocaust Struggles with Forgiveness, Reconciliation, Justice. The volume is co-edited by Roth and fellow symposium member David Patterson, who holds the Bornblum Chair in Judaic Studies at the University of Memphis, Tenn., and includes contributions from six other symposium members. Published early in 2004 by the University of Washington Press, the anthology is the first in the new Pastora Goldner Series in Post-Holocaust Studies. Grob says symposium members have committed to submitting one book per year to the press. The vast majority of authors or contributors will be symposium members. Several new volumes are being reviewed, among them an anthology titled Fire in the Ashes: God, Evil, and the Holocaust. Each book in the Goldner Series will feature on the cover the artwork of symposium member and former FDU Professor of Fine Arts Arie Galles. Part of his recently completed series of charcoal drawings titled “Fourteen Stations/Hey Yud Dalet,” the chosen painting for the covers is Auschwitz-Birkenau, one of Galles’ 14 depictions of aerial views of concentration camps. One particularly rewarding part of the symposium, participants say, is the regular Circle of Friends session, in which the members share aesthetic representations that symbolize an aspect of the members’ relationship to the subject. Some sing songs, some tell stories and, as Knight describes, “We experience moments of insight, disclosure and bonding.” The Circle of Friends is the setting in which two original members were mourned in 1998 following their deaths. It is these moments that, according to the participants, especially define the group and the symposium. Whether through the Circle of Friends, observing Sabbath rituals, playing a game of “intercultural charades” or spending a late night at the pub telling jokes, members have built a strong camaraderie. Relaxing during a break in the symposium are, from left, Arie Galles, former FDU professor of fine arts; Hubert Locke, professor emeritus and dean emeritus of the Daniel J. Evans School of Public Affairs, University of Washington, Seattle; and Stephen Feinstein, director, Center for Holocaust and Genocide Studies, University of Minnesota, Twin Cities. Such bonds helped the conference tackle more problematic subjects in 2002, such as the Palestinian-Israeli conflict and the impact of September 11, 2001. Grob and Knight also scheduled a session on “identifying the minefields” to deal with these emotional and controversial issues. “We want to allow the community to work out differences in a way that produces healing,” Knight says. The program’s location in Wroxton provides a majestic setting. FDU’s British campus, located in the village of Wroxton, lies in the heart of England between Oxford and Stratford-upon-Avon, 75 miles northwest of London. The Abbey, a 17th-century Jacobean mansion, is a national historical landmark. As beautiful as Wroxton is, though, Knight says, “The magic is not the place, but being together for reflection, renewal and concentrated work.” And that magic continues long after the members leave Wroxton. As Frede-Wenger says, “The spirit of collegiality and trust extends far beyond the Wroxton grounds.” This is a genuine network, and small groups work together on the various collaborations while individuals meet or talk often. During the development of the symposium, the number of participants grew slightly but was capped at 39, which remarkably includes 31 of the 36 initial respondents. “The fact that we have retained such a significant proportion of our original participants is evidence of the success of our endeavor,” say Grob and Knight. 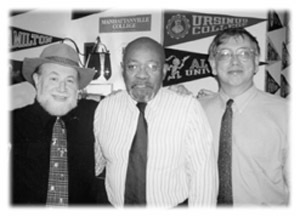 The 2004 symposium featured, for the first time, a day dedicated solely to networking. Grob says this could encourage even more collaboration or allow members to seek the counsel and advice of their colleagues. The arts were especially showcasedin 2004. Symposium member Gottfried Wagner, great-grandson of the famous composer, presented excerpts, including musical examples, slides and a videotape, from an opera project, “Lost Childhood,” based on a Holocaust survivor’s memoir. There also were dramatic readings of the testimony of victims from various times and places, compiled by symposium participant Robert Skloot, professor of theater and drama at the University of Wisconsin, Madison. ©Copyright 2004 Fairleigh Dickinson University. All rights reserved.